The Paleocene‐Eocene Thermal Maximum (PETM), a transient greenhouse climate interval spurred by a large release of carbon to the ocean‐atmosphere ca. 56 million years ago, provides a geological point of comparison for potential effects of anthropogenic carbon emission. Geochemical proxies and fossil assemblages offer insight into the continental shelf response to the PETM, but global ocean‐atmosphere models cannot resolve shelf processes at sufficient resolution for model‐data comparisons. We present high‐resolution simulations of the pre‐PETM and PETM North Atlantic basin using the Regional Ocean Modeling System (ROMS), including a resolved continental shelf along the eastern margin of North America in the Salisbury Embayment. ROMS’ high‐resolution, terrain‐following coordinate system permits greater vertical resolution and eddy resolution along continental margins while also capturing open‐ocean processes. We find that during the PETM, benthic oxygen concentration ([O2]) in the Salisbury Embayment decreases 18% to an average state of year‐round mild hypoxia, while average benthic calcite saturation (Ω) declines from 4.4 to 2.3. These benthic decreases are driven largely by enhanced benthic oxic respiration, which occurs despite no increase in shelf productivity. Instead, increased respiration stems from less vigorous off‐shelf transport of organic matter due to (a) weakened along‐shelf water currents and (b) weakened coastal upwelling that forces productivity closer to the shelf seafloor. Model results do not include riverine inputs, which would have further lowered benthic [O2] and Ω. Our data suggest lowered benthic calcite saturation and mild hypoxia as an upper bound on the oxygenation state of the Salisbury Embayment seafloor during the PETM. Many mass extinctions of life in the sea and on land have been attributed to geologically rapid heating, and in the case of the Permian–Triassic and others, driven by large igneous province volcanism. The Siberian Traps eruptions raised ambient temperatures to 35–40°C. A key question is how massive eruptions during these events, and others, could have killed life in the sea and on land; proposed killers are reviewed here. In the oceans, benthos and plankton were killed by anoxia–euxinia and lethal heating, respectively, and the habitable depth zone was massively reduced. On land, the combination of extreme heating and drought reduced the habitable land area, and acid rain stripped forests and soils. Physiological experiments show that some animals can adapt to temperature rises of a few degrees, and that some can survive short episodes of increases of 10°C. However, most plants and animals suffer major physiological damage at temperatures of 35–40°C. Studies of the effects of extreme physical conditions on modern organisms, as well as assumptions about rates of environmental change, give direct evidence of likely killing effects deriving from hyperthermals of the past. The Late Triassic and Early Toarcian extinction events are both associated with greenhouse warming events triggered by massive volcanism. These Mesozoic hyperthermals were responsible for the mass extinction of marine organisms and resulted in significant ecological upheaval. It has, however, been suggested that these events merely involved intensification of background extinction rates rather than significant shifts in the macroevolutionary regime and extinction selectivity. Here, we apply a multivariate modelling approach to a vast global database of marine organisms to test whether extinction selectivity varied through the Late Triassic and Early Jurassic. We show that these hyperthermals do represent shifts in the macroevolutionary regime and record different extinction selectivity compared to background intervals of the Late Triassic and Early Jurassic. The Late Triassic mass extinction represents a more profound change in selectivity than the Early Toarcian extinction but both events show a common pattern of selecting against pelagic predators and benthic photosymbiotic and suspension-feeding organisms, suggesting that these groups of organisms may be particularly vulnerable during episodes of global warming. In particular, the Late Triassic extinction represents a macroevolutionary regime change that is characterized by (i) the change in extinction selectivity between Triassic background intervals and the extinction event itself; and (ii) the differences in extinction selectivity between the Late Triassic and Early Jurassic as a whole. A transect of paleoshelf cores from Maryland and New Jersey contains an ~0.19 m to 1.61 m thick interval with reduced percentages of carbonate during the onset of the Paleocene‐Eocene Thermal Maximum (PETM). Outer paleoshelf cores are barren of nannofossils and correspond to two minor disconformities. Middle paleoshelf cores contain a mixture of samples devoid of nannofossils and those with rare specimens characterized by significant dissolution (i.e., etching). The magnitude of the decrease in carbonate cannot be explained by dilution by clastic material or dissolution resulting from the oxidation of organic matter during early diagenesis. The observed preservation pattern implies a shoaling of the calcite compensation depth (CCD) and lysocline to the middle shelf. This reduced carbonate interval is observed during the onset of the PETM on other continental margins raising the possibility that extreme shoaling of the CCD and lysocline was a global signal, which is more significant than in previous estimates for the PETM. An alternative scenario is that shoaling was restricted to the northwest Atlantic, enhanced by regional and local factors (eutrophication from rivers, microbial activity associated with warming) that exacerbated the impact of acidification on the shelf. Boron isotopes (δ11B) records from tropical ocean corals have been used to reconstruct paleo-pH of ocean for the past several decades to few centuries which are comparable to the resolution of instrumental records. 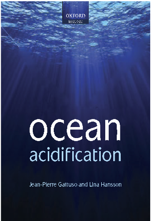 In most of the studies, attempts have been made to decipher the role of anthropogenic CO2 forcing to recent trend of ocean acidification based on δ11B derived paleo-pH records. However, such attempts in past were often hindered by limited knowledge of oceanographic factors that contributed to past pH variability and changes. In this study, we have evaluated pH records reconstructed using δ11B records from the Pacific and the Atlantic Oceans corals and investigated major forcing factors that contributed to sub annual-decadal scale pH variability and changes since the industrial era ~1850AD. To the best of our knowledge, total eight δ11B records from the Pacific and two from the Atlantic Oceans are available in published literatures. The compilations of these records show large variability; range between 26.27–20.82‰ which corresponds to pH range 8.40–7.63 respectively. Our investigation of pH records from the Pacific ocean based on principal component analysis (PCA) reveals that atmospheric CO2 can explains maximum up to ~26% of the total pH variability during 1950–2004AD, followed by the ocean-climate oscillations (i.e. ENSO and PDO) driven oceanographic factors up to ~17%. The remaining large variability (~57%) could not be explained by above forcing factors and hence we invoke possible influence of metabolic processes of corals and/or changes in micro-environments within the reefs which are often neglected in interpreting paleo-pH records. Therefore, we highlight the need for detailed investigation in future studies to understand about the exact mechanism, processes/factors that controlled boron isotope fractionations in coral reef environments. Further, our investigation reveals that amplitude of the ENSO driven pH variability shows fivefold increase during 1980–2000AD compared to the previous three decades (1950–1980AD). 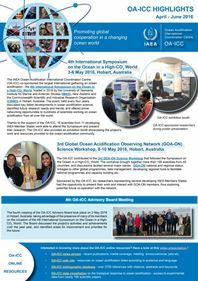 This observation is consistent with the historical records of global coral bleaching events and therefore underscores role of ENSO driven environmental stress responsible for coral bleaching events. Considering model based projections of increasing frequency and amplitude of extreme ENSO events in the backdrop of recent global warming, bleaching events are likely to increase in the next decades/centuries.